The Port is ideally located — the Canadian National (CN) Railroad's north-south main rail line runs directly adjacent to the port's property and provides regular service to the facility as needed. 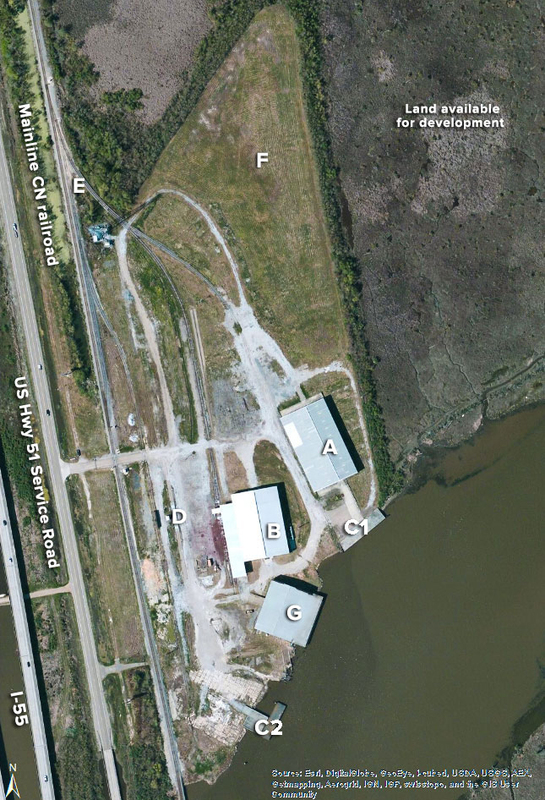 The terminal is also located directly adjacent to Interstate 55 with nearby direct links to I-12, I-10, and I-59, and outside of the congested Port of New Orleans and Port of Baton Rouge cargo markets. 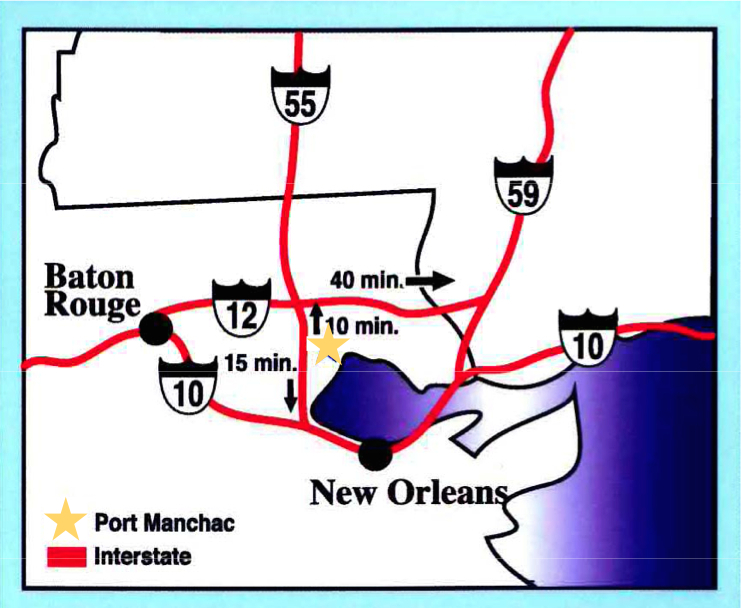 The 140-acre Port Manchac inter-modal terminal offers a prime inland location to store and trans-load bulk, break-bulk, neo-bulk, and containerized shipments by barge, rail, and truck. Barge service to the Port of New Orleans/Mississippi River is accessed through Lake Pontchartrain/North Pass. 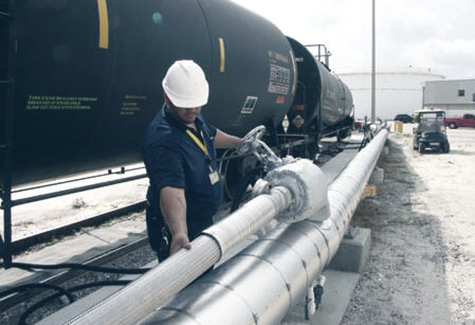 140-acre Intermodal Terminal Facility capable of handling bulk, break-bulk, neo-bulk, and containerized cargo by barge, rail, and truck. A. New 30,000 sq.ft. warehouse available to lease for industrial use, serviced by water, rail, and truck. B. 30,000 sq.ft. warehouse currently leased to Purus Industries, manufacturing liquid-bulk products. C1-2.Two barge docks capable of supporting loads of 1000 lbs./sq.ft. D. 70 ft. truck scale certified by the Louisiana Department of Transportation and Development. E. Three rail spurs totaling 6000 ft. with direct access to the main line of the Canandian National Railroad with service provided six says a week. F. 20 acres of open lay-down storage. 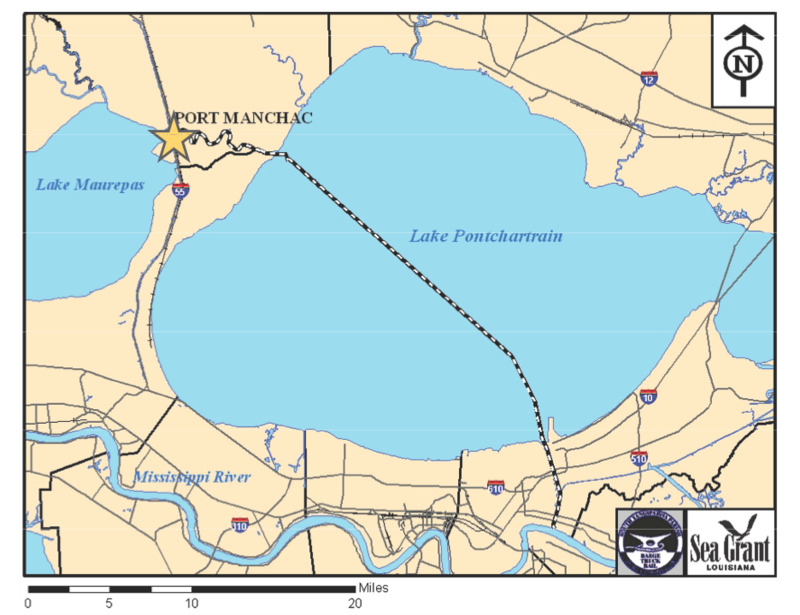 The South Tangipahoa Parish Port Commission serves as the official governing authority for Port Manchac. The seven (7) commission members are appointed by the governor of LA to six (6) year terms and receive no compensation for their community service to the organization. The commission was originally created by Act #299 of the Louisiana Legislature in 1962.